Green Team members, Leeann Soyka and Lauren Pelzner, led their high school to be the first certified PLT GreenSchool in their school district. 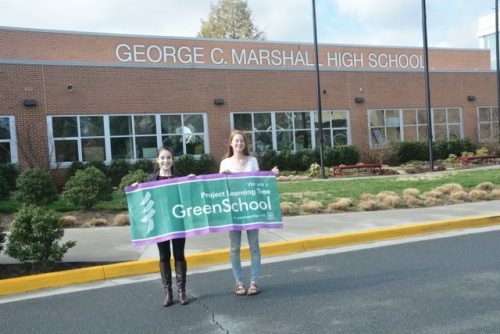 As the leader of the Green Team at my high school (George C. Marshall in Falls Church, VA), I’m proud of the work we have done to become the first high school in Fairfax County Public Schools to achieve Project Learning Tree’s GreenSchools certification. Obtaining this certification was truly a collaborative effort that involved more than 100 students, the principal, and the efforts of countless volunteers. Along the way, I not only discovered how to make my school a greener and healthier place, but also gained skills in leadership and learned about many environmental careers. 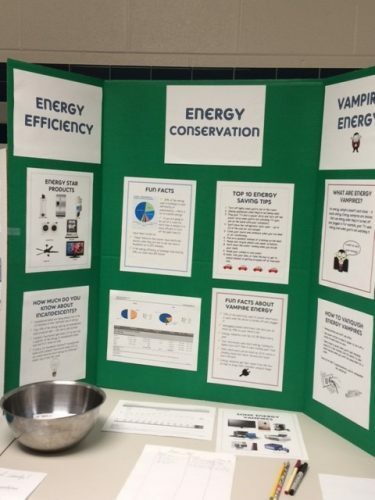 An information table at school events is a great way to recruit Green Team members and raise awareness. Next we recruited members for the “Green Team” to help carry out the Investigations. We did this by announcing meetings and hosting a table at school activities. One of our most successful recruiting techniques was a display at school-wide events. Students who stopped by our table could draw a question about energy – correct answers were rewarded with candy! Then they could sign up to receive emails and texts about upcoming Green Team meetings. 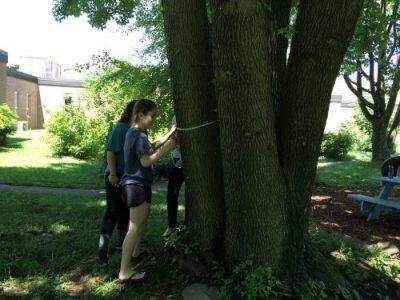 Green Team members measure the circumference of a tree on the school grounds to determine the dollar value of the ecosystem services it provides. Because the School Site Investigation takes more time than some of the others, we conducted this Investigation during the summer when it was nice to be outside and when students had more time to volunteer. One of our favorite parts of this Investigation was assessing the health of the trees on the school grounds and measuring their circumference to calculate the dollar value of the ecosystem services that the trees provide. We did this using i-Tree, a free online tree benefits calculator. We determined that the value was $2,527 per year! This information was shared to highlight the importance of caring for trees on the school property and to encourage additional tree planting. Student volunteers also worked in the native species and vegetable garden throughout the year, mainly during study hall and after school on Fridays. We had great success getting donations of both plants and labor from local nurseries and landscape companies. In addition, we received donations and raised money to expand our green roof. 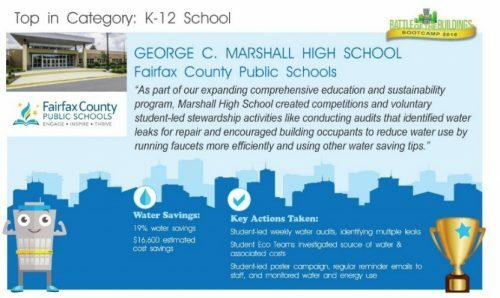 George C. Marshall High School won the top award for saving water. Join the EPA’s Battle of the Buildings Water and Energy competition (EPA Battle of the Buildings) to get faculty and students excited about saving water and energy at your school! To kick-off the competition, our principal invited us to speak at a faculty meeting about the GreenSchools program and ways that staff could get involved in water and energy conservation efforts. We presented a PowerPoint and provided a handout with water and energy saving tips. Then over the next several months, an energy or water saving “Tip of the Week” was announced over the loudspeaker, emailed to faculty, and posted in hallways, bathrooms, and classrooms. The Green Team also assessed each classroom, bathroom, water fountain, and outdoor spigot for leaks. Problems were reported and fixed. This resulted in significant savings on utility bills. Our efforts paid off when we found out that our school won the water conservation award for K-12 schools in the EPA Battle of Buildings competition! Find out if your school works with energy consultants. If so, see if they can meet with students to discuss energy saving strategies specific for your school. 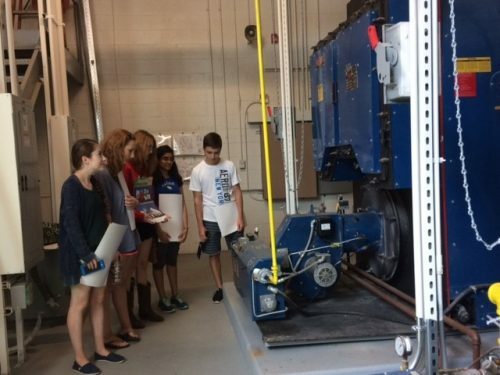 Energy consultant provides a tour of the HVAC system at George C. Marshall High School. During our audit of waste and recycling, we discovered that many students weren’t taking the time to place recyclables in proper containers – especially during lunch. So we decorated the recycling bins and moved them to obvious locations in the cafeteria. Green Team students took turns standing by the bins to remind students how to properly recycle. We also discovered that our school district has a “Food Sharing” policy that allows schools to donate unopened food to local shelters and food banks. You may be able to create extra enthusiasm for cafeteria recycling and composting by getting the principal or a teacher to dress up in a banana costume, or other compostable fruit or vegetable! 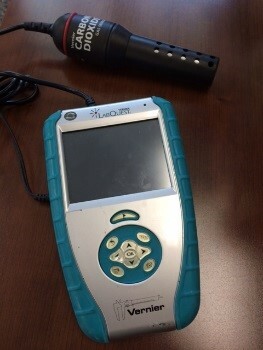 Green Team members used a monitor to measure CO2 levels in classrooms. One of the most interesting things about the Environmental Quality Investigation was monitoring classrooms for temperature and carbon dioxide levels. We found out that if the level of CO2 in classrooms is too high or classrooms are too hot, it can make students lethargic! So we borrowed a CO2 monitor and an infrared laser thermometer. The data we collected showed that CO2 levels were within acceptable ranges, however, many classrooms were too hot or too cold. With this data, teachers felt empowered to report issues for repair. 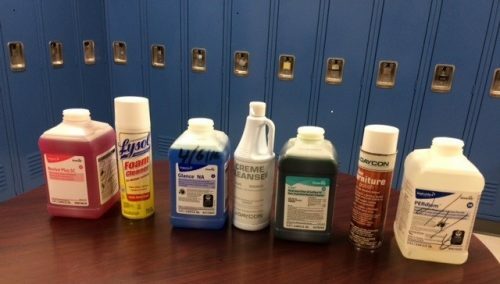 Cleaning supplies used at George C. Marshall High School. Be sure to monitor CO2, temperature, and humidity levels in classrooms when they are occupied to get useful readings. We also met with our school’s head custodian to determine if the school was using “green” cleaning supplies. He was enthusiastic about showing our Green Team the labels on the cleaning supplies and explaining the school’s cleaning policies. Green Team members host a display at the Town of Vienna Green Expo. Participating in community events, such as garden days and green expos, is a great way to share your success and encourage other schools and institutions to green their buildings. To encourage other schools in our district to ‘go green,’ we hosted two open houses where teachers, administrators, and students could tour our school and learn about our efforts. The Green Team, as well as teachers and parent volunteers, led the tours and answered questions. 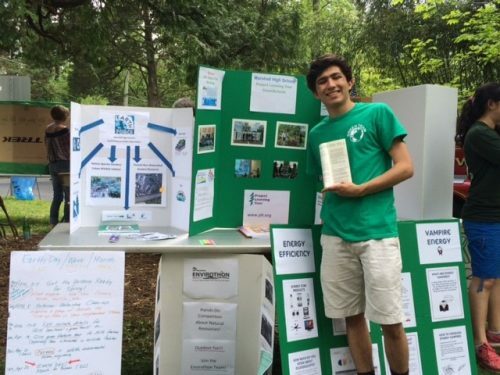 Our Green Team also participated in a community “Green Expo.” At this event, we shared why we started the GreenSchools program and how other schools in the area could get involved. To become a certified PLT GreenSchool, schools must also demonstrate they are incorporating environmental and sustainability education into other areas of the school’s curriculum. At my high school, the majority of students take “Environmental Systems and Societies” in 11th or 12th grade. This environmental science course requires students to do original research on a topic of their choice. One of the great things about the GreenSchools program is that it provided us with ideas for course projects. For example, a student investigated the impact that cars idling in the “Kiss and Ride” area have on outdoor air quality, another investigated how plants in classrooms affect indoor air quality, while others monitored the water quality of a stream behind the school. This course also inspired many art students to incorporate environmental themes into their art work. For instance, one friend built a 3-D sculpture out of used plastic water bottles that showed how they harm the environment, another depicted coral reefs in her ceramic pieces to create awareness about protecting these fragile environments, and I used the theme of human’s connections with nature in my senior art project. In addition, because we had more than 100 students on our Green Team, there were many opportunities for us to share ideas and work together on class, science fair, and service projects. If your school can’t tackle all five of PLT’s GreenSchools Investigations in one year, pick one or two that are most relevant to your school to get started. By participating in PLT’s GreenSchools program, I saw how what I’m learning in my science classes is directly applicable to solving environmental problems in the real world. I also experienced the power of teamwork in accomplishing my school’s sustainability goals. For more information about becoming a Certified PLT GreenSchool and free access to PLT’s GreenSchools Invesitgations, register here. Good luck and have fun! Editor’s Note: George C. Marshall High School offers the International Baccalaureate (IB) program, which aims to develop internationally-minded people who, recognizing their common humanity and shared guardianship of the planet, help to create a better and more peaceful world. PLT’s GreenSchools program supports this goal by providing a cross-discipline mechanism for students to explore their environment, think critically about ways to make improvements, and implement environmental action plans.